Square Enix has released a statement for what will be released in the holiday downloadable content on December 22, 2016. Happy Holidays to you from Square Enix! For this month, new DLC (Downloadable Content) is going add new features, items, and maps for you to explore in the world of Eos. Their DLC will be available come December 22, right before Christmas. While they’re adding the new DLC, they’ll be adding some patch works, updates, and bug fixes for happy Christmas gaming. New Game Plus (New Game +) – you know what this means! The moment you finish the game, all the data you have in the first play through will be carried onto the next save file. This means that all your gil and equipment will move onto your new chapter. Remember those secret bosses? It’s easier to train for it now. When running the new game plus, you can have an easier time grinding your way through the game. Running out of potions? No need to fear! Since your gil will carry over, there’s no need to be thrifty in spending for potions. Buy potions, hi-potions, and even ingredients to fully complete Ignis’ food list. Photo Frames – Instead of having those plain photos, there are now frames that can design the pictures Prompto takes. It’s like having Instagram and Snapchat in Final Fantasy XV. Who knows? Filtres might come in soon. Ring of Resistance – A protective piece of jewelry that renders the entire party to be resistant to magical friendly fire. Blitzer’s Fanfare – A scroll of sheet music that provides additional AP for earning an A+ in Time outside of training. Tactician’s Fanfare – A scroll of sheet music that provides additional AP for earning an A+ in Finesse outside of training. Stamina Badge – Equip this to keep Noctis sprinting and hanging without blowing his stamina. Carnival Passport – An adorably adorned ticket that whisks the bearer away to a fun-filled carnival for a limited time. Festive Ensemble (available late January) – Christmas outfits for a more festive time! Holiday Pack + Exclusive Photo Frames (available late January) – Additional themes the player can add to Prompto’s photos when sharing over social media. But what about us who doesn’t have the Digital Premium version? There’s no need to fret. Even with some of those who bought the exclusive edition, the holiday packs also have a free DLC for your copy. 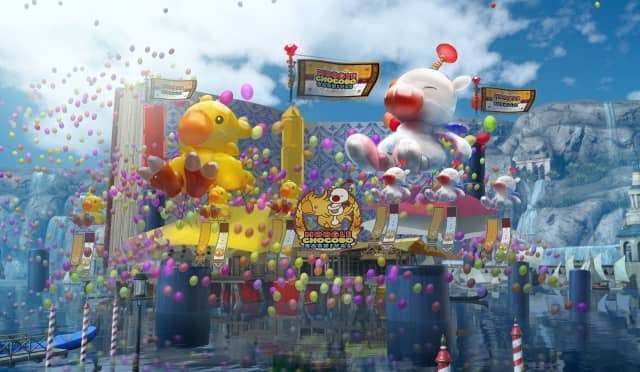 Also, you get a passport heading off to the Moogle Chocobo Carnival! Warrior’s Fanfare – A scroll of sheet music that provides additional AP for earning an A+ in Offense outside of training. Nixperience Band – A device that stops experience points from being tallied, preventing the party from leveling up for an added challenge. Choco-Mog Tee (available late January) – A comfy t-shirt featuring everyone’s favourite mascot: the Moogle and the Chocobo. Perfect for attending carnivals. Gilgamesh, a villain in Final Fantasy V and a Guardian Force in Final Fantasy VIII, makes a cameo in Final Fantasy XV as a boss. He is known as a summon that unleashes a barrage of weapons from his vault. When Seifer Almasy (Final Fantasy VIII) kills Odin, Gilgamesh takes his place. This is seen when Squall or any of the members try summoning Odin only for Gilgamesh to appear instead. This famous and classic boss will appear during an episode known as “Gladio”. Since this is a new episode, we can only assume two things. That, it can either be accessed during New Game + or mixed in the main plot. Gilgamesh’s appearance opens new maps for the players to enjoy. When fighting him, old time Final Fantasy players can enjoy living the nostalgia of coming across one of the FF classics. With that, it looks like Square Enix has taken a step to expand the world of Final Fantasy XV. They’re leaving multiple Easter Eggs around the place while keeping their hold on Final Fantasy XV’s originality. So, time to hope for the best. AFFILIATED LINKS: Final Fantasy XV Review: Good or Bad?